સૂત્ર: "Stella Clavisque Maris Indici"
"હિંદ મહાસાગરની ચાવી અને તારક"
મોરિશિયસ (/məˈrɪʃ(i)əs, mɔː-/ ( listen); ફ્રેંચ ભાષા: Maurice), અધિકૃત રીતે રિપબ્લિક ઓફ મોરિશિયસ (French: République de Maurice), હિંદ મહાસાગરમાં આવેલો એક ટાપુ દેશ છે જે આફ્રિકા ખંડના અગ્નિ છેવાડે મૂળભૂમિથી લગભગ ૨૦૦૦ કિ.મી. દૂર આવેલો છે. ↑ The Mauritian Constitution does not mention any official language, only Section 49 mentions that the official language of the National Assembly shall be English, while French may be used. 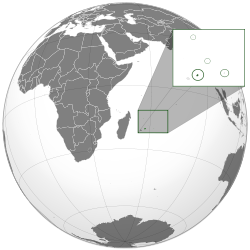 ↑ "Republic of Mauritius, Government Portal (Mauritius)". Archived from the original on 10 May 2011. 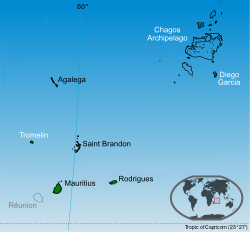 ↑ "Africa :: MAURITIUS". CIA The World Factbook. ↑ ૮.૦ ૮.૧ ૮.૨ "Mauritius". International Monetary Fund. આ પાનાંમાં છેલ્લો ફેરફાર ૬ જાન્યુઆરી ૨૦૧૯ના રોજ ૨૨:૦૫ વાગ્યે થયો.